The Rev. John Caspar Stoever, Jr., began preaching to families in 1733 and effected the organization of the Lutheran Church in Monocacy on November 26, 1738. The early congregation met at different locations near Thurmont until the first home in Frederick, a log church, was constructed in 1746. During the summer of 1752, construction started on a new building. Nine years later, the entire community came to the official dedication of the new church. The building was constructed of native blue limestone and had just a single tower. In 1771, the church purchased two bells from London, England, one of which is still being used in the West bell tower. Their original cost was $560, plus a transportation fee of about $400. In 1870, the smaller bell was recast in Baltimore, Maryland, having developed a crack from almost a century of ringing. The recast bell continues to be used today. The outbreak of the Civil War left its mark on the church. 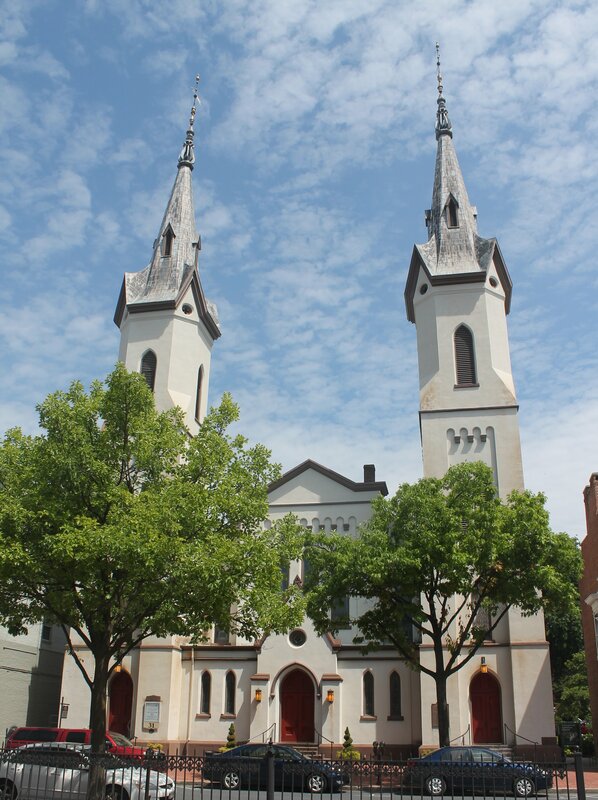 When Lee’s army reached Frederick on September 6, 1862, the pastor of the church had to exercise special restraint, for on the next day the church was crowded with Confederate officers and soldiers at the church services. The church was more seriously involved in the War during the battle of Antietam later that month. The Union Army seized the church on the opening day of the battle to be used as a hospital. 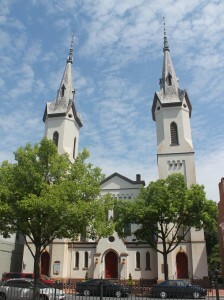 In November 2013, the Evangelical Lutheran Church of Frederick turned 275 years old.